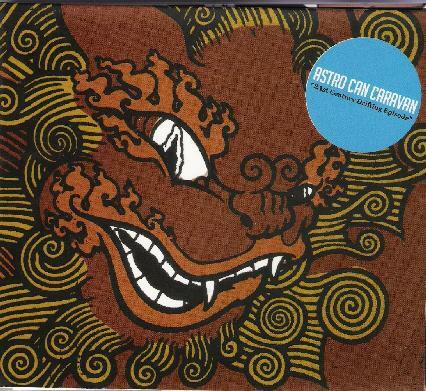 Astro Can Caravan - "21st Century Drifting Episode"
Highly experimental, with one foot solidly in the RIO camp and the other in outer space, Astro Can Caravan is an unconventional mix of large ensemble post-Sun Ra cosmic jazz, Magma-influenced Euro-fusion and Herbie Hancock/Miles Davis-styled avant-jazz funk. The 20 members of ACC (most of whom are apparently Finnish) all display a consummate musicianship and a keen awareness of the intricacies of ensemble playing throughout the ten tracks on 21st Century Drifting Episode, and in the process virtually create a new sub-genre one might call "big band space rock." The uncanny mesh of horns (trumpet, trombone), winds (sax, oboe, clarinet), guitar, bass, synthesizer and four percussionists, in addition to being unusual when transposed to the context of space rock, creates some undeniably astounding altered states of consciousness if listened to for extended periods of time. The more overtly Arkestra-influenced pieces ("De Revolutionibus Orbium Coelestium" and "Kohoutek") are brilliant, if not wholly original, exercises in solar jazz, in some ways extending, though not surpassing, the experiments in cacophony and atonalism that Sun Ra pioneered on Heliocentric Worlds. But ACC is quite capable of rocking the house, too, as both "Meteor Shower Geel" and "Mad Oracle" show. The up-tempo pace allows for some dynamic jamming where the synthesizers and saxes literally race each other as if they were on some intergalactic speedway. Imagine if Sun Ra's Arkestra were composed of members of Amon Duul II and Can - 21st Century Drifting Episode is the kind of album he would've done. Like most "difficult' music, you'll have to listen to it at repeated intervals in order to truly appreciate the thorough-going nonconformist approach that Astro Can Caravan adopts - especially on a piece like "The Scale of Anubis" - but rest assured that 21st Century Drifting Episode will clear out the cob webs in your CD collection and will probably find a place of distinction there in the near future. For more information you can visit the Astro Can Caravan web site at: http://zerga.deepturtle.net/astrocan.html.